Oversized opulence sets this shimmering silver display cabinet apart from the rest. 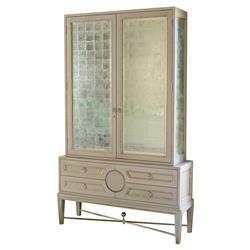 Tall glass doors, finished in traditional French silver leaf eglomise, grace the top cabinet, while the bottom chest holds four generously-sized drawers. Metallic silver knobs embellish each cabinet door and drawer. An illuminated interior holds two clear shelves, perfect for displaying collectibles of any kind.